Flying multihulls may be grabbing the headlines, but the next development in what some are calling the most ground-breaking period in yacht design is already here: flying monohulls. By this we don’t mean Moths, the 11ft single-handed dinghies that put foiling boats on the map, but keelboats. 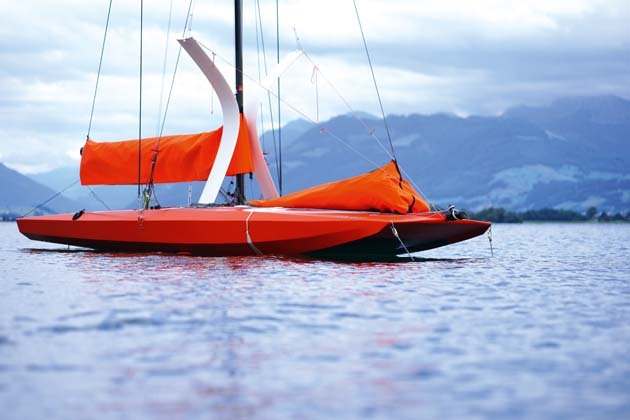 The Quant 23 is believed to be the world’s first foiling keelboat. The secret behind its design lies with the latest-generation Dynamic Stability Systems (DSS) foil arrangement. Her evolution has occurred just as it did with multihulls. 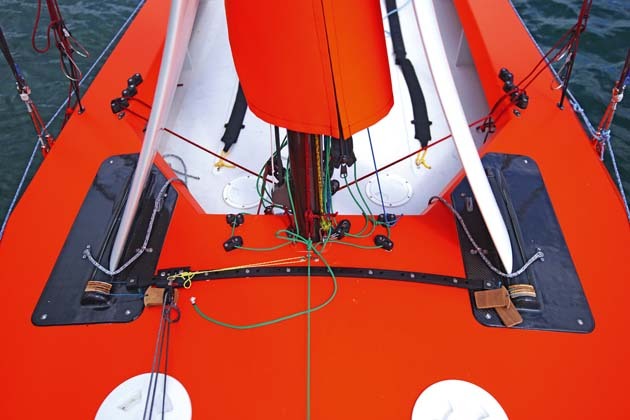 From the late 1990s on, curved foils were used in ORMA 60 trimaran floats to provide lift to leeward and prevent the leeward float from burying its bow. Fifteen or so years later, these had evolved into the foils that first made the Emirates Team New Zealand AC72 catamaran fly. In a similar way the DSS foil has graduated from providing lift to leeward and added righting moment, with clear performance benefits, to providing enough lift for the entire hull to become airborne. The flying Quant 23 follows on from the prototype Quant 28 and production Quant 30, both of which are ‘standard’ DSS, narrow-hulled sportsboats, developed by Quant Boats in Switzerland. All the Quants have strong UK ties, however, having been designed by DSS creator Hugh Welbourn and, in the case of the 23, built by Paul Jennings’s company, Projects by Design, in Cowes. The Quant 23 bears little visual relationship to its predecessors. 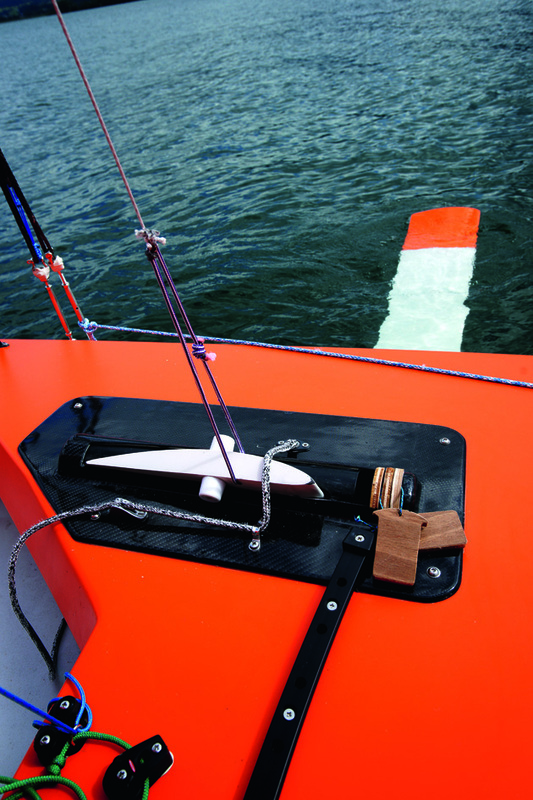 While the Quant 30 had twin DSS foils that were curved – if you looked at them from above – each retracting into its own case in the forepeak, the 23’s foils are more akin to daggerboards (or daggerfoils) in that there are two of them, deployed vertically through the hull – rather than through the topsides at the waterline. 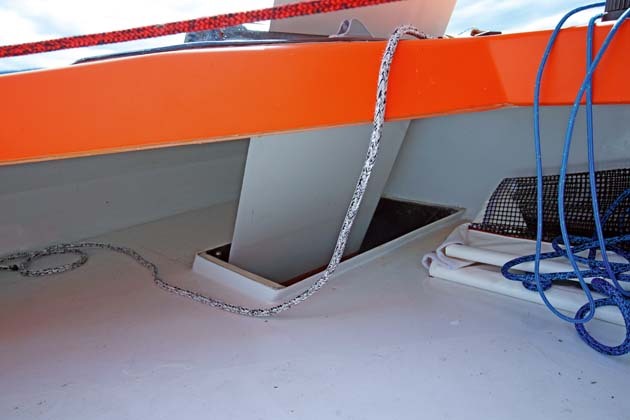 These have a bend in them so that when fully lowered they protrude outward, horizontally from the hull, like regular DSS foils, only deeper in the water. 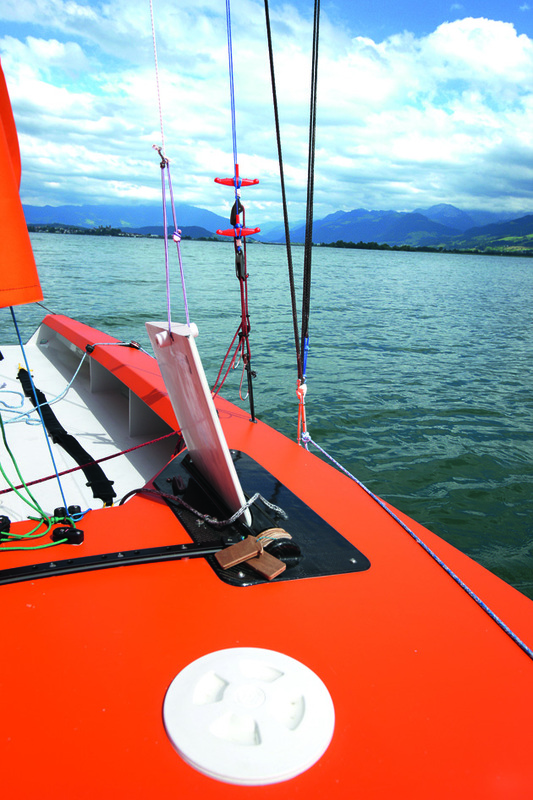 The Quant 23 is, of course, also fitted with the now ubiquitous inverted-T foil rudder, common to Moths and AC catamarans, which, in combination with the main DSS foil, is what enables the boat to fly. The end result is a foiling keelboat, although it should be pointed out that because so much of the righting moment is provided by the DSS foil, the bulb weight has been pared down. It is enough to recover the boat from a knockdown, but is substantially lighter than the bulb on a non-flying, non-DSS boat. Although the new foils are clearly the headline-grabbing feature of the Quant 23, also notable is her scow-shaped hull. Again this is a major departure from previous Quants, and indeed other Welbourn DSS boats such as the Infiniti 36 and 46. Blunt-bowed scows are typically beamy, carrying their breadth most of the way forward. However with chines, a hull-deck chamfer and an ultra-low freeboard, the Quant 23 looks like a scow for the 21st Century. The hull shape not only provides good stability, but also a wide base for the crew to get weight outboard without the design having to resort to racks or wings. 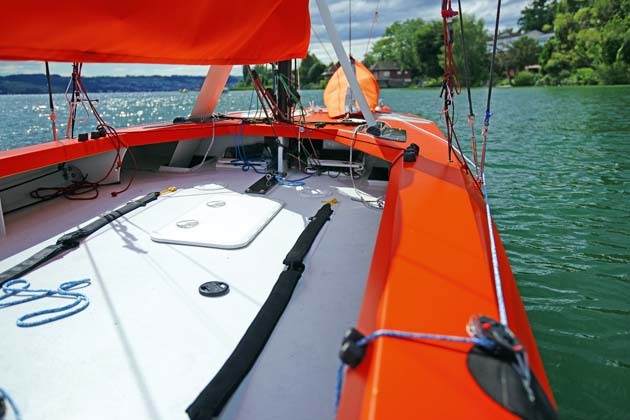 The scow hull is also central to a less obvious fundamental concept of the boat: that while pretty much all the most common foilers on the market require a reasonable amount of skill, agility and athleticism to be sailed efficiently, the Quant 23 doesn’t. 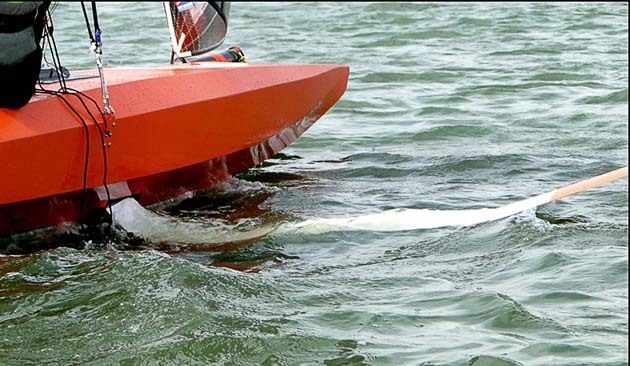 “The idea behind it is simply a boat that Joe Bloggs can leap into and ten minutes later he’s flying, without having to learn a whole myriad of complicated systems, loads of adjustments or anything like that,” declares Welbourn, agreeing that the boat could be described as a ‘gentleman’s foiler’. 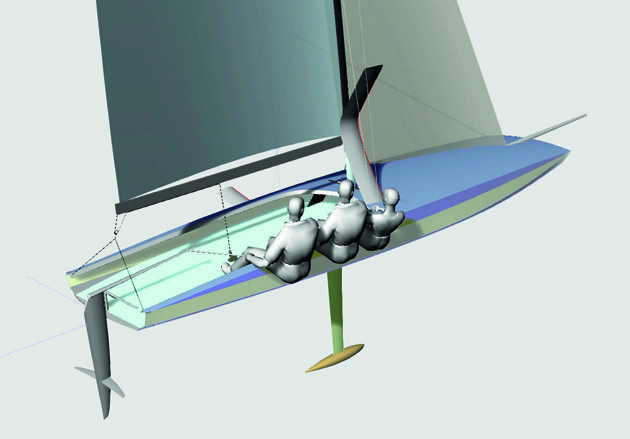 Saying this, the Quant 23’s foil configuration does allow different modes of sailing, depending on what is required. It can be sailed without the foils, purely as a scow keelboat. 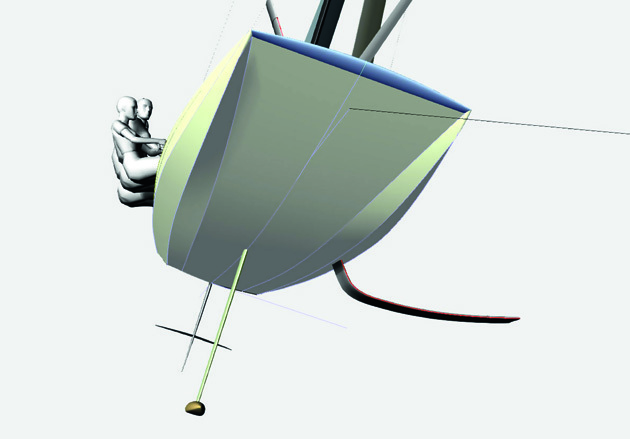 With the foils fitted, but not fully lowered the boat can sail in displacement mode yet still with the usual DSS benefits of added righting moment, or the foil can be fully lowered (by a further 300mm) for full foiling mode. The all-important aspects of ride height and heave stability require no user intervention. 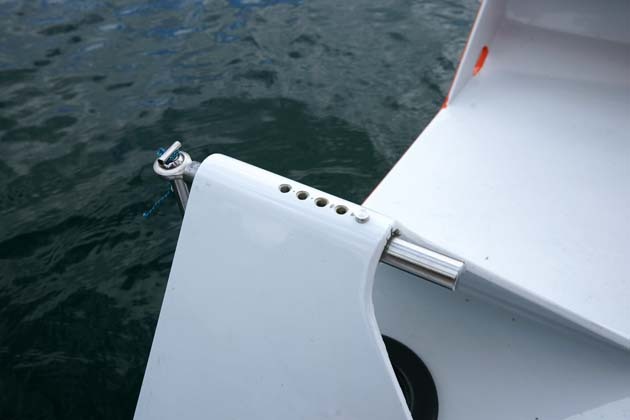 Depending on the point of sail and heel angle, the DSS foil will reduce its lift from either the inboard or outboard end of the foil the more it lifts out of the water as the boat accelerates, in a similar way to a V-type foil. However, this ease of use comes at a small price: that is, ultimate top speed. Still, Welbourn’s view is that the top speed – which has yet to be determined, but he believes to be in the mid-20s – will be high enough for most people. More important is the simplicity of the boat and that it can foil in very little breeze. Perhaps most impressive is that upwind she was beginning to lift out in just eight knots of wind, although we don’t have information on how cracked off she was to achieve this. One of the most noticeable differences between monohull and multihull foilers at present is that the former seem able to take-off upwind in less pressure. So is this the future of yachting? Welbourn says that the Quant 23 format is scalable, although there are definite limits. “You run into the total drag cost, so there’s a whole set of physics that puts constraints into your system.” So don’t expect foiling to be appropriate any time soon for your beloved ferro-cement cruising yacht.